The Best Electric Mobility Scooters Explained – TOP 10 reviews, tech specs, ratings and price comparisons. You are about to discover the Best Electric Mobility Scooters of 2018. Today’s models are more than just a medical device. Browse through our categories and see how design plays a huge role in making mobility scooters a lifestyle choice. Don’t let disability and special needs hinder you from enjoying the outdoors. In addition to the standard models, check out ones that could climb terrain and take you up inclines. How about ones that disassemble without tools? Or something that easily fits into the trunk of your car. You won’t look at electric mobility scooters the same way again! Things you should know before buying a mobility scooter. What Are Electric Mobility Scooters? A regular wheelchair provides mobility for people unable to walk as a result of injury, disability or illness. 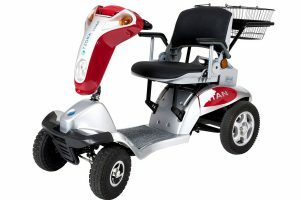 But when the person lacks the stamina or the arm/shoulder flexibility necessary to use a wheelchair, the electric mobility scooter sometimes called an electric wheelchair makes a great alternative. An electric mobility scooter is a battery-powered means of transport that has a seat, three, four or five wheels and a foot plate. Persons with a systemic or whole-body disability (such as coronary or lung problems, bariatric issues or arthritis) who are still able to stand, walk a few steps and sit upright will find the scooter extremely useful. Today’s electric mobility scooters take in the best in design and creativity. Some look like small, compact cars and others possess that well-loved motorcycle vibe. Check out our TOP 10 Electric Mobility Scooters list and see how they combine good design and function that best suits your needs. Electric Mobility Scooters have been pushing the envelope as the years go by. Most scooters can now maneuver terrain, making it a convenient device to use for running errands, commuting to and from work or simply enjoying the outdoors. The Victory Sport 4-Wheel Electric Scooter’s biggest selling point is in its comfortable padded swivel seat, backrest and armrests. 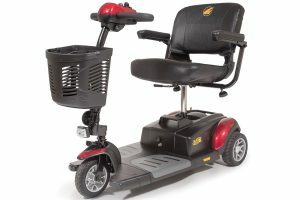 It is lightweight, equipped with anti-tip wheels and can accommodate a maximum of 300 lbs. The Phoenix 4 is well-loved for its height-adjustable swivel seat, armrests and ergonomic throttle control. Maintenance is easy as the non-marking and anti-tip tires are flat-free. The maximum load capacity on this model is 350 lbs. Ideal for outdoor use. The SE 3-Wheel offers great maneuverability. It features a sharp turning radius and a compact 3-wheel design. Perfect for tight, compact spaces. Customers who have purchased the SE 3-Wheel love how portable this model is. It is lightweight and can be easily disassembled. Load capacity is around 250 lbs. The BuzzAround XL3 offers more foot room, great tight indoor space maneuverability and a 300-lb weight capacity. Seat height is adjustable. Maximum speed is at 4.5 mph. This model is well-designed as it includes a tiller-mounted basket as well as snap-on shroud panels. The Go-Go Sport 4-Wheel model is well-loved for its stability and travel-ready features. Feather-touch disassembly permits simple frame separation with only one hand. The all-new frame design conveniently separates into five super lightweight pieces for easy transport. Top speed is at 4 mph while maximum weight capacity on this model is at 325 lbs. The all-terrain Hummer XL Folding 4-Wheel Electric Scooter is the ultimate in design. With its sleek features and design, it hardly looks like your mobility scooter. Maximum speed reached is 6.8 mph! Customers love the wide 18-inch seat and unique handlebars. It is also easy to maneuver. Maximum load capacity is 300 lbs. The EV Rider – Mini Rider Compact Scooter 4 Wheel is almost like your last-mile vehicle. It boasts a top speed of 5 mph and a distance range of 15 miles on a single charge. It disassembles easily. Load capacity is around 275 lbs. This fully automatic model folds and unfolds with a remote control. It is very portable and perfect for air travel and cruise ships. Weight capacity is 300 lbs. Distance covered on a single charge is 13.5 miles. This model is the fastest in its class. With a top speed of 7.5 mph and a distance range of 15.5 miles on a single charge, you could use this as a last mile vehicle for work or errands. This 3-wheel model is ergonomic and comfortable to maneuver. It can also be used on steep hills and ramps. Its high torque motor coupled with a distinct design makes it a mobility scooter of choice. The PW-1000XL is the lightest model in the “heavy duty portable power chair category”. It boasts of speeds of up to 5 mph and ample room both in its seat size and deck. Suitable for users of up to 220 lbs, the tires that come with this model are composed of 4 spring suspensions. It folds and opens in just 2 seconds, making it perfect for a small car’s trunk. They’re powerful and easy to maneuver. Best of all … they look GOOD. More and more customers are opting out of the proverbial mobility scooters look. Bulky has been replaced with “sleek and stunning”. We’ve scoured the market for the best performing scooters that also score high in the gorgeous department. Here’s our take on the TOP 3 Electric Mobility Scooters. The Hummer XL isn’t a mountain climber but it scores the highest (five stars) when it comes to incline maneuverability. This model is very stable and works well on the pavement as well as on and off road. Other notable features include right and left turn signals, rear tails lights and front headlights. The seat that comes with this model is wide and made of memory foam. Customers have given this 4-wheel model a top rating for its stability and compact size. Most 4-wheel mobility scooters are suited for the outdoors and barely make it through doorways. The EV Rider, gets that issue out of the way by integrating size and maneuverability into its frame. Owners of the Transformer Automatic have only praises for this model. We haven’t come across a negative comment. It folds to a compact size, making it perfect for aircraft and cruise ships. Weight capacity is 300 lbs. Accessories include a cane holder and cup holder. Electric mobility scooters are driven using handlebars much like those of a bicycle’s. The handlebars are mounted on a tiller (a post) with the driver on a seat that has both a backrest and armrests. Steering a mobility scooter requires that your arms be outstretched. Your upper body has to have ample strength for you to stay fully erect. You also must have considerable arm reach and range of motion to maneuver comfortably. With these in mind, know that mobility scooters also require more room to move and turn compared to a manual or power wheelchair. So unless specified, most models are primarily designed for outdoor use. As regulations vary from state to state, always take note of safety. Consult your city’s local government for any requirements you may need to be aware of. Your medical condition and lifestyle are two of the most important factors when deciding which mobility device to buy. 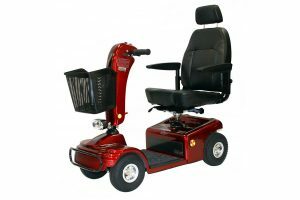 Power chairs are smaller, more compact and operated via joystick through the arm, mouth or other body parts. It fits through hallways and is easy to maneuver around corners because it has a smaller turning radius. It is also prescribed for Individuals who need full-time assistance for mobility. Most importantly, power chairs are often covered by Medicare or private insurance if deemed medically necessary (with a doctor’s prescription). An electric mobility scooter, on the other hand, is bigger and operates with a tiller / handle bars. It has a broad turn radius that provides great stability whether indoors or outdoors. It is ideal for part-time or occasional use and is used mainly outdoors for convenience. Unlike power chairs, it is an out-of-pocket expense. 3-wheel vs 4-wheel mobility scooters: 3-wheel models have a tighter turning radius compared to its 4-wheel counterparts. While the 3-wheel models are more compact, 4-wheel models provide greater stability (and speed). Lightweight/ Travel vs Heavy Duty: Lightweight scooters are either foldable or capable of being disassembled without need for tools. This allows portability and easy loading onto a vehicle or trunk. The portable models are ideal if the user has an able-bodied companion to help with assembling or disassembling the unit. Heavy duty mobility scooters, on the other hand, feature larger tires, faster speeds, greater distance ranges and higher ground clearance. Unlike portable scooters that have a maximum load capacity of 250 to 300 lbs, heavy duty models can comfortably accommodate 350 to 500 lbs. If you live or work in highly congested urban areas, space and energy saving devices are the only way to go. You want tools and equipment that don’t require too much thought and maintenance. 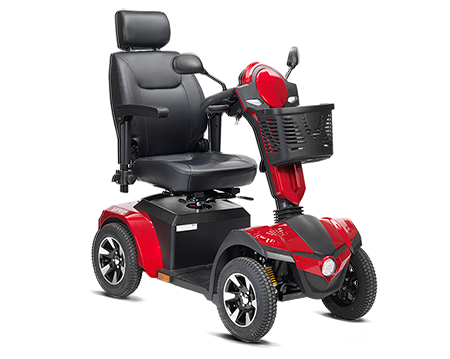 Check out our TOP 3 models for urban areas that are compact, provide comfort and feature great maneuverability. The BuzzAround XL3 offers excellent indoor maneuverability. It has a 300-lb weight capacity and features an adjustable seat. Maximum speed reached for this model is around 4.5 mph. A spacious tiller-mounted basket is included for personal items. The Go-Go Sport 4-Wheel is well-loved for its travel-ready features. Disassembling the unit is easy. Feather-touch disassembly permits simple frame separation with only onehand. Top speed is 4 mph while maximum weight capacity is a whopping 325 lbs. If you need to snake your way through the city, the EV rider is almost like your last-mile vehicle. It boasts a top speed of 5 mph and a distance range of 15 miles on a single charge. Load capacity is 275 lbs. We’ve sifted through suggestions from the best occupational therapists in the country to find out the 4 most important factors to consider when purchasing your electric mobility scooter. Will you be doing short journeys to the grocery or running errands at the neighborhood clubhouse? Are you with able-bodied family members who can help assist you? Or do you plan to take your scooter for longer journeys? Is your area hilly? Electric mobility solutions come in a variety of capacities. The smaller, lighter (and often more reasonably priced) ones are best suited for smooth pavements. However, it may not provide the same comfort as the more expensive scooter with three, four (or even five) wheels that are built for streets and roads. Portable models often come with a maximum weight capacity of around 250 to 300 lbs. It is essential to choose a mobility scooter that best suits the intended load because excess weight affects stability. In addition, such practice invalidates the warranty. Take into consideration other special needs you may have. Do you have full use of both limbs? Do you suffer from arthritis? You may opt for a Power Chair if a joystick is more convenient for you to operate. Where do you intend to keep your scooter when not in use? Is your storage facility secure and dry? If this isn’t available, do you have enough space in your hallway or living area? If you need to bring your mobility scooter indoors, make sure that your chosen model fits through the doorway. Some models feature foldable armrests and tillers. Medium to larger sized models can only be stored in a garage or shed. If this is the case, you might want to consider installing ramps and electrical outlets for charging. Note that while portable scooters are foldable (or capable of dismantling), some models require disassembling (with or without tools). You may not want to do this often, especially if you don’t have an able-bodied companion to assist you. The most expensive or even the most full-featured model isn’t always the best choice. You don’t want to pay for features you won’t need or use. For instance, if you simply intend to use your scooter for leisure strolls through the mall, you don’t need a five wheel model that can run at tops speeds of 5 mph. 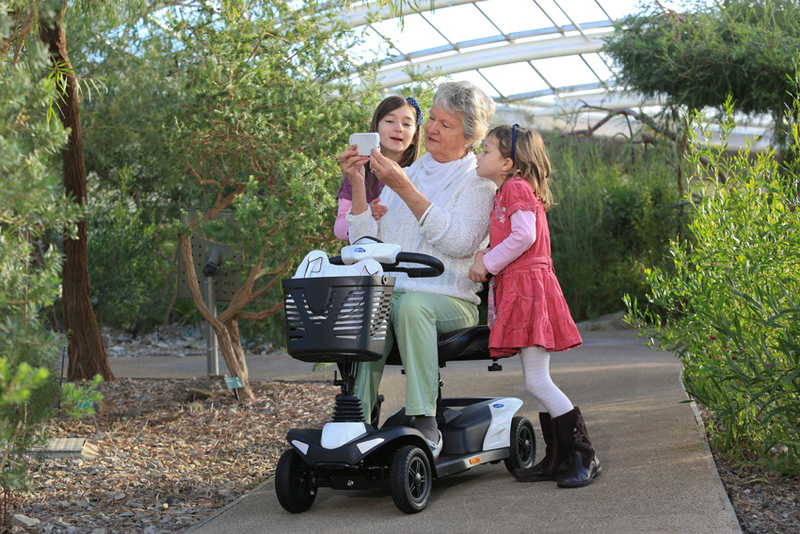 A mobility scooter is both a lifestyle choice and a medical device. The importance of purchasing the right one should never be underestimated as this will be an essential part of your daily routine. Our selection of mobility scooters for sale can help people who are suffering from mobility restrictions regain their freedom. There are no more hassles and manual mechanisms that are often brought about by traditional wheelchairs. To understand more about electric mobility scooters, check out the user’s guide below. An electric mobility scooter is a power-operated aid that is similar to a wheelchair with the configuration of a motor scooter. 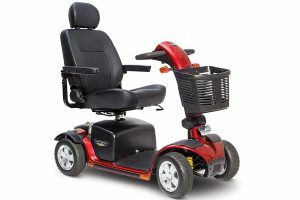 This device incorporates the use of motor-powered wheels paired with a comfortable seat resting on a high-quality chassis – basically a blend of convenience and style on the go. They primarily help physically challenged individuals to gain access from one place to another. The traditional wheelchair poses the same benefits; however, mobility scooters can provide more advantages. With a motor-powered mechanism, users don’t have to exert too much effort in operating an electric wheelchair for sale. Even though there is lack of arm capability, any user can manipulate the scooter with ease. Our selection of mobility scooters for sale can provide more movement through the swiveling chair. Users don’t have to move or rotate the entire machine in order to access things in various directions. It provides help for persons with systemic as well as full body disabilities such as obesity, arthritis, and lung issues but can still walk for a few steps, sit upright, and control the tiller. Portable electric mobility scooters can be disassembled or folded into various parts, typically around three to four parts. This type can be used for travels as it can fit perfectly inside the trunk of the car. Also, portable scooters tend to be lightweight as compared to their full-size counterparts. Our selection of portable mobility scooters for sale are lightweight but are capable of supporting several hundreds of pounds. These electric mobility scooters have a tight and sturdy turning radius. They are recommended to be used indoors or within tight spaces. Four-wheel electric mobility scooters are designed to be more stable and safe. The risk of tipping over while using them has been reduced due to the addition of several features. Furthermore, they can easily be maneuvered through hilly slopes, rough terrains, and other outdoor surfaces. In selecting the right type of electric wheelchair, you should evaluate whether you’re a frequent traveler or just an indoor person. Portable scooters have smaller seats, and they also contain less padding to become more lightweight and easier to disassemble. Almost all of our mobility scooters for sale have swivel seats to offer ease in getting on or off. Furthermore, seats are also adjustable depending on the height as well as comfort preference of the user. Those mobility scooters that come with Captain’s seats are the most comfortable as they are equipped with contoured backrests and more padding. Our power wheelchair for sale is maneuvered with the use of tillers. These are T-shaped steering wheels that allow the wheels to move towards the desired direction. These tillers can also make the scooter move in either forward or reversed direction. Sometimes, they can also control the speed and signals. High-quality tillers are designed with wraparounds to offer ease in steering, especially to those who are suffering from limited hand strength. 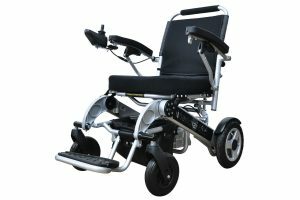 To provide a smoother ride for every user, our electric wheelchair for sale is equipped with a suspension. It also provides a safer and sturdier ride when going over uneven and rough surfaces and bumps. The suspension on full-sized scooters are always present; however, most travel scooters don’t include this feature. Most electric scooters have an electronic braking mechanism which operates when the pressure has been released from the control panel. In this case, the brakes will be engaged when the unit is not on forward or reverse mode. Some scooters’ brake system are combinations of disc brakes and electronic brakes to provide additional safety. Solid wheels – you will never experience a flat tire on solid wheels. However, your riding experience might often be rougher. Most of our portable mobility scooters for sale come preinstalled with solid wheels. Pneumatic wheels – these wheels make your ride smoother, yet they are not as sturdy as the solid wheels. Since they are air-filled, your scooter may go flat. Majority of full-sized mobility scooters for sale have this type of wheels. Foam-filled wheels – electric mobility scooters that have foam-filled wheels are shock absorbent and more durable than those with solid wheels. They require the least maintenance among the three types. The 12-volt or 24-volt batteries of mobility scooters are rechargeable. Charging time ranges from eight to ten hours. A fully-charged full-sized scooter may travel up to 30 miles, while a smaller one may be used for about ten to 15 miles. Batteries can be exposed to the usual wear and tear but can be replaced or upgraded for better performance. The lifespan of a battery ranges from 12 to 18 months before an upgrade or replacement is necessary. Every user can also purchase and carry extra packs for additional mileage. These are just the major features you should look into when purchasing one of our mobility scooters for sale. There are also accessories such as oxygen transporters, holders, baskets, lights, canopies, horns, and other additional features to provide more comfort and convenience. Our selection of mobility scooters for sale comes with varying speed which is dependent on the pressure being exerted on the forward or reverse. The speed is determined by the speed dial located on the control panel of the scooter. If you’re still getting the hang of using the scooter, you should opt for a lower speed setting. Also, when used on the road, the speed setting should range from 4mph to 8mph. The stability of the unit especially on inclining slopes and sharp curves is essential. Our mobility scooters for sale are designed with an anti-tip mechanism during maneuvers. It is installed on the wheels and on the entire baseline of the scooter. The seats also offer safety and comfort features to prevent users from falling off the scooter during the ride. Electric mobility scooters can travel up to 30 miles depending on the performance and battery pack. Some upgraded scooters can even run over 35 miles. Small-sized scooters usually go for around 15 miles. Your needs as the user or rider should be met with utmost safety and comfort. Our range of mobility scooters for sale can provide you with the help you need to access places when help from other people is not an option. Living independently even with a disability is one of the primary goals of our mobility scooters for sale. Gain back the freedom that was once stolen by an illness or incapacity with these scooters. Get yours now!